Lima – the City of Kings. This fascinating and enormous city has a lot to offer, so don’t be intimidated! With incredible colonial history behind the ornate facades of its most important buildings, there is much to explore. Museums, restaurants and the malecón – a gorgeous walk along the oceanside cliffs of Miraflores and Barranco – Lima is definitely worth a visit. For a great starting point, check out Lima Easy, with tips about both visiting and living in this modern city. >> Want to go? Check out our Lima tours! Visit one of the city’s many fantastic museums: Museo Larco, the MNAAHP, MALI, the Amano Museum, just to name a few! Walk along the malecón in Miraflores – take in the ocean views, try your hand at paragliding or check out the unique outdoor mall, LarcoMar! Visit some of the huacas, pre-Columbian pyramids, nestled in among the modern-day buildings in the heart of the city. Travel about an hour outside the city to visit Pachacamac, one of the great archaeological centres in Peru. La Dama Juana – can Combine a show with a buffet dinner at this top spot in Miraflores, located in the Larco Mar. Brujas de Cachiche – A great spot in Miraflores for Peruvian Creole food. Astrid y Gastón – Yes, that Gastón – Gastón Acurio, a local celebrity and one of Peru’s top chefs. “Torre blanca” means “white tower” in Spanish, but contrary to this name, this hotel is actually terracotta-colored! Hostal Torreblanca offers an affordable option near to Central Miraflores. It’s a rambling building on a roundabout, just one block from the coast and about 10 blocks from Parque Kennedy, Lima’s best people-watching spot. This Lima hotel has an assortment of rooms, some a little small but varied and very functional. There are lots of stairs and spaces to explore in this interesting Lima hotel. Some of the furnishings may be dated but the entire hotel is spotless. If you are arriving in Peru for the first time and staying at the Casa Andina Miraflores Centro, it may be your first experience with this reliable Peruvian hotel chain. Offering a 3-star level of service, adequate clean rooms, and a range of other amenities, all the Casa Andina Peru hotels offer a dependable, affordable stay. Located about 2 blocks north of the Parque Kennedy Roundabout, it’s a great standard hotel in Lima. While housed in a 100 year old mansion, this classy Boutique hotel is a newer hotel in the arty Barranco neighbourhood. It offers an experience rather than simply a hotel stay! Apart from the unique colonial mansion feel, with high ceilings, local artists are featured in the beautiful paintings and sculptures that are scattered around the Boutique hotel. With only 12 rooms, this a homey place to stay. It is located just 5 minutes’ walk from the Plaza de Armas in Barranco, and provides ease of access to the arty – and tasty – restaurants and bars of Barranco. Hotel Antigua Miraflores is a charming old colonial building on a quiet street. Rooms feature beautiful antique furniture and most have a view onto a gorgeous courtyard with a fountain. This is definitely a hidden gem of a hotel in Lima. It’s about 5 blocks away from downtown Miraflores, in a quiet and secluded location. There are a range of different room types. The Traditional and Colonial rooms are at the front of the building and ooze character, while the “Señorial” rooms at the back are recently built and very ample. 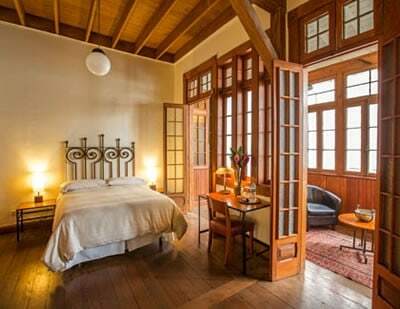 A small boutique hotel, Casa Inca is housed in a refurbished Lima mansion with plenty of history and an old-world atmosphere – quite a contrast to the modern Lima high rises all around it! Located right on the coast in Miraflores, this is a great hotel in Lima if you are looking for peace and quiet and old world character in the heart of Lima. As a bonus, Casa Inca is a short walk to LarcoMar, the upscale shopping and dining center in Miraflores. While Barranco is quite sleepy, it’s also a unique view into life in an upscale part of Lima and we have included this hotel because it’s full of character. Throughout the home are incredible pieces of art by Victor Delfin, renowned Peruvian sculptor and artist. This is a perfect place for art-loving families or couples looking for a Lima hotel stay by the sea. This charming boutique hotel in Lima is an excellent art deco choice in the quiet residential San Isidro neighborhood. It has a gorgeous atmosphere and the amazing attention to detail you would expect in a much more expensive hotel. As restaurants and nightlife are not close by, you can dine in its elegant restaurant, with delicious food and presentation. About 35 minutes from the airport (in light traffic) it can be a good mid-range option for those with an early flight. 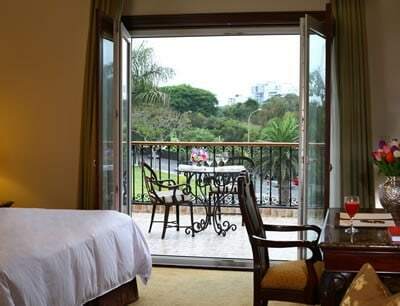 This Casa Andina Premium Hotel in Lima has an excellent location right in the heart of Miraflores. The decent-sized rooms are impeccably furnished, and there is an excellent restaurant and café on site. A total bonus is the indoor heated pool which provides an excellent opportunity to unwind after a busy trip. A great option for Lima hotels! This hotel offers a very reliable stay in the heart of Lima. Just 2 blocks from the Ovalo Kennedy, the rooms are large, with double glaze windows (to keep out the noise of the traffic) and with all the amenities you would expect from a Doubletree hotel. They have a small heated rooftop pool which is a bonus, and a bit of a rarity among Lima hotels. This hotel has to be one of the hotels in Lima with the most – it’s like you stepped back in time. The Country Club Hotel Lima has a beautiful foyer and large rooms, with big beds and bathrooms. Each room is decorated slightly differently from the next with beautiful antiques. Located across from the Lima Golf Club, this hotel has a very elegant restaurant where the crème de la crème of Limeño society comes from lunch. The Wyndham offers a convenient and clean/modern hotel to arrive at Lima Airport late at night and out to your next destination the next day. You arrive at the International airport and walk across the bridge to the hotel, which is located in the airport car park. Has the style and amenities of a recently opened hotel. Not cheap, but you need to add up the cost of 2 taxi rides, (each about 45mins to an hour) and the price of extra sleep, to the cost of staying anywhere else. Other clients suggest to check in, and then return to the hotel for breakfast. The Holiday Inn Lima is a new and very welcome addition to the available Lima hotels near the airport. Not as close as the Wyndham (you need to cross a large busy road) you are still within easy walking distance of the airport. A shuttle is also offered. As expected, for the Holiday Inn chain, rooms are serviceable, clean and provide a good night’s rest between flights. Villa Barranco is a recently restored 1920’s republic-era house that is absolutely charming. Like all the Ananay hotels, these are first class places to enjoy a boutique hotel experience in Lima with a personalized stay. In addition, Barranco is a wonderful place to stay for those interested in Lima’s art scene. Located in the trendy artisan ‘barrio’ of Barranco, it’s no surprise that the Hotel B is promoting itself as the first arts-boutique hotel in Lima. Not only is Hotel B located in the heart of bohemian Barranco, it houses its own art collection, is surrounded by neighboring galleries and is linked directly to the Lucia de la Puente Gallery, which provides guests with opportunities for private viewings. From the moment you enter the gorgeous foyer at Hotel B, you feel that you are somewhere both different and a cut above the rest. With just 17 suits, this is without a doubt the most exclusive hotel in Lima. A famed French architect, Claude Sahut, was originally commissioned to design the property as a summer retreat for a well-known Lima family, and construction was completed in 1914. Another feature of the hotel is the signature restaurant by Oscar Velarde who achieved international recognition for his innovative, palate-pleasing blend of Peruvian and Mediterranean ingredients, long before Lima was famous as a culinary capital. If you are going to splurge, opt for one for the upper rooms in one of the best Lima hotels!